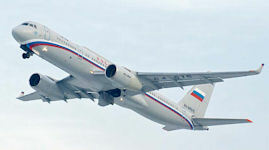 The Tu-214SR fixed-wing aircraft, a modified version of the Tupolev Tu-214 airliner, was developed especially for the Presidential Executive Office. The new Tu-214SR aircraft replaced outdated repeater aircraft based on the Il-18 aircraft (75453, 75454, 75464), which had been operated by a special squadron for over 40 years. The Tu-204 has been manufactured since 1990 at the Aviastar SP plant in Ulianovsk and since 1996 at the Gorbunov KAPO (Tu-214 version) in Kazan. The Tu-214 is a modification of the Tu-204 passenger airliner with increased takeoff weight and carrying capacity. On its base it was developed a number of military aircraft for special purposes: communications aircraft, control and relay (TU-214PU, Tu-214SR, Tu-214SUS), reconnaissance aircraft Tu-214R and to monitor the international program "Open Skies", the Tu-214ON. 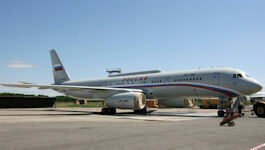 The Tu-214CP aircraft is a special radio relay airplane designed on the basis of the common passenger Tu-214. The relay version’s main purpose is to provide President of Russia with communication. Unlike the basic model, the Tu-214 is equipped with additional fuel tanks, owing to which its cruising range increases to 10 thousand kilometres, power supply systems and a radio complex. 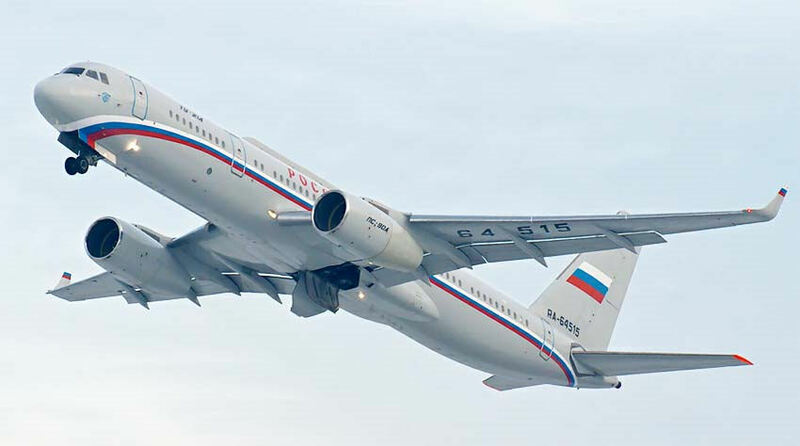 Externally, the Tu-214SR is different from the usual Tu-214 radomes at the top of the fuselage. 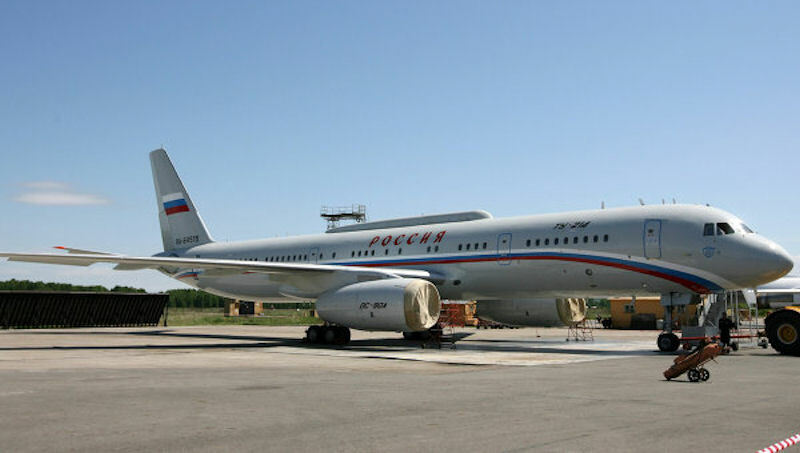 The aircraft can accommodate 72 people, has an additional power supply system, not piloted by three, as the "classic", and the four pilots The number of passenger seats equipped with seatbelts - 72, including places for relief crew (only 61 in the first place was a Tu-214SR). The flight range is increased from 7 to 10 thousand kilometers through the installation of additional fuel tanks. Power aircraft reinforced added four generators, as the board filled with appliances and units. Aircraft-repeaters Tu-214SR created by completion of the basic Tu-214 and installation of the onboard radio communication systems (BRTKS), the main of which - the aircraft relay communication node SSA-214m development of "MNIIRS." Tu-214SR is equipped with radio systems provided through satellite systems with terrestrial communication facilities and other aircraft. Russian Managers use of radio relay communication. However, this link works only within the line of sight, so it needs a system of ground stations, aircraft, satellites and repeaters. Tu-214SR is intended for operation in the northern areas, where the problematic use of communications satellites over the equator. The advantage of such a system is its high security. Information is on a narrow beam with great speed and quality. Unlike conventional radio, the information transmitted by radio relay complexes, it is very difficult to intercept, and set its point of origin and reception. Despite the high cost of such a system, it provides the highest possible confidentiality requirements. Special communications complexes were made ? ?by the Omsk Production Association "Radio Plant Popov". The internal layout of the aircraft has also undergone changes. Instead of the usual rows of seats solid doors and walls. Behind the cockpit is located salon for 12 people for protection. Next three blind cover for the operators and the chief of special communication node. Behind them are two of the passenger compartment for the so-called progressive groups and journalists. On 01 June 2009 two machines were solemnly transferred to the Office of Presidential Affairs of the Russian Federation. Vladimir Karnozov JSC "KAPO Gorbunov" transferred to the customer - the Special Squadron Office of the President of the Russian Federation. 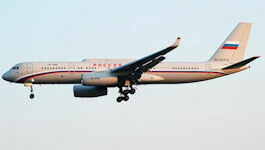 In January 2012, the fleet added one more new airplane, a modernised Tu-204-300. The President of Russia Staff in 2012 signed a state contract for building and delivering three Tu-214 CP airplanes worth totally 8.85 billion roubles ($280 mln). The order was found in the 2012 schedule of government orders, published on 20 January 2012. According to the schedule, the contract was to be fulfilled before December 2015. The President Staff would place an order for several aircraft engines, worth totally about 2.1 billion roubles, as well. The term was until December 2012.